nicu's FOSS'n'stuff: 3G woes: maybe NetworkManager isn't that bad? 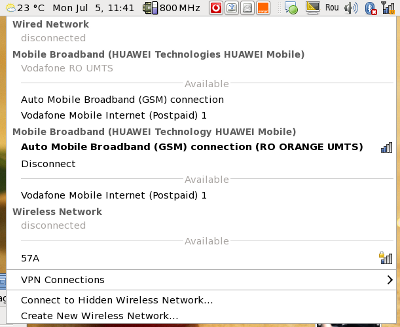 3G woes: maybe NetworkManager isn't that bad? I curse NetworkManager a lot, these days my main internet connection at home is 3G, using a Huawei E160 modem, an Orange 3G subscription, Fedora 13 and an EeePC (a match made in heaven, yeah, right) and the combination works painfully bad, not sure why, due to the service provider, the cheap modem or NetworkManager but from what I remember it works worse than used to in Fedora 12, which made me sometime think about downgrading (or jumping to F14 as soon as the Alpha appears, but that would mean inflicting GNOME 3 earlier... uh, no good solution on the horizon). I won't talk here about the awful user interfaces (supplied by the carriers and you must use them) which make your eyes hurt, brain explode and usability die (compared with them NetworkManager is a breeze). My problem here is with making them both work together on the same computer, which on Linux is natural: you add the connections in NM (with a wizard) and just select whatever you want from a menu. My task here was investigating the quality of the Vodafone solution, try the Orange one and evaluate which is better, so the computer already had installed Vodafone Mobile Connect and the E220 drivers. In this situation Orange Internet Everywhere (you must love those names!) refuses to install itself, it supposedly installs (automatically) some drivers and then reports and this is all, it says then you already have the the latest version. Installing the application manually, it doesn't see any connection. The two apps just refuse to stay installed both at the same time and uninstalling is not easy either (last time when I had to remove the Vodafone app and make the Orange one work I had to do a system rollback to get rid of everything). Needless to say, the modems are carrier locked (you can't buy unlocked ones) so you can't switch SIM cards and no apps work with the SIM from the other carrier. And no independent application is available from the hardware manufacturer (Huawei). And putting Linux on that netbook is not an option either. I said you already how much I hate 3G? My experience of using both a Huawei E220 3G modem and my Nokia N82 phone for internet access through NetworkManager have largely been positive. Sometimes when the signal cuts out, it doesn't reconnect, and you are forced to remove and reinsert for NM to pick it back up, but both are automatically detected. For OpenDNS or Google DNS respectively. 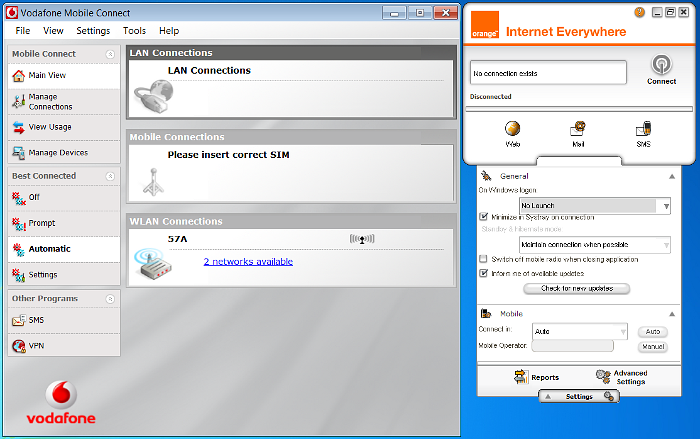 Do that by right-clicking NM, Edit Connections, Mobile Broadband Tab, click your entry for Huawei and then 'Edit', ipv4 Settings Tab, change the drop-down from 'Automatic (PPP)' to 'Automatic (PPP) addresses only', then in the 'DNS servers' field below enter the above supplied DNS ip addresses delimited by a comma (,). Click 'Apply' and you'll be good to go. NM will now ALWAYS use your manual DNS server ips and add them to /etc/resolv.conf for each and every session. @Dietrich: this is what I did a while ago until I learned at times I don't have a connection to the Google DNS server, so I went back to the ISP provided ones. Is my sunglasses curse broken?